In a large bowl, whisk together egg white, vanilla and water until frothy. Add almonds and stir until the nuts are completely coated. Using a coarse sifter, sift in granulated sugar, brown sugar, cocoa powder, cinnamon, cayenne and salt (this is done to make a smooth, no-lump mixture). Add into the almond mixture and stir to thoroughly coat. Scoop the mixture onto a large baking sheet lined with foil and coated with nonstick spray. Spread the almonds to an even single layer. Place into the oven and bake, stirring every 10 minutes, until the almonds are toasted - about 35-45 minutes. To check if they have roasted enough, carefully break one or two almonds open and check to see if the inside is lightly golden. Remove from the oven and lift the foil off the pan and place on a wire rack to cool completely. When cool, place the almonds into a large bowl and add a couple tablespoons of cocoa powder - toss together with a spoon until the nuts are coated. 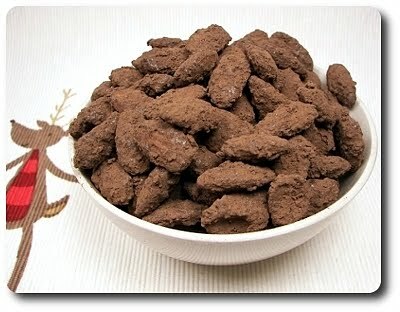 If you find you have too much cocoa powder left, quickly sift the nuts to remove any excess. Joe, these look wonderful (as do all your photos!). Do you think that I can use regular unsweetened cocoa instead of Dutch process? EllenL - You could, but it wouldn't be as "smooth" tasting. Though, it will be more chocolate-y - which isn't a bad thing!